This statistic shows a timeline with the net profits of King Digital Entertainment as of the fourth quarter of 2015. During the most recently reported quarter the gaming company had generated 90.67 million U.S. dollars in net profits. Popular titles include Candy Crush Saga, Farm Ville Saga as well as Bubble Witch Saga, all of which are monetized through in-game item purchases. King's gaming apps are available on Facebook as well as on mobile platforms. The company defines gross bookings as the total amount paid by their users for virtual items and for access to skill tournaments. 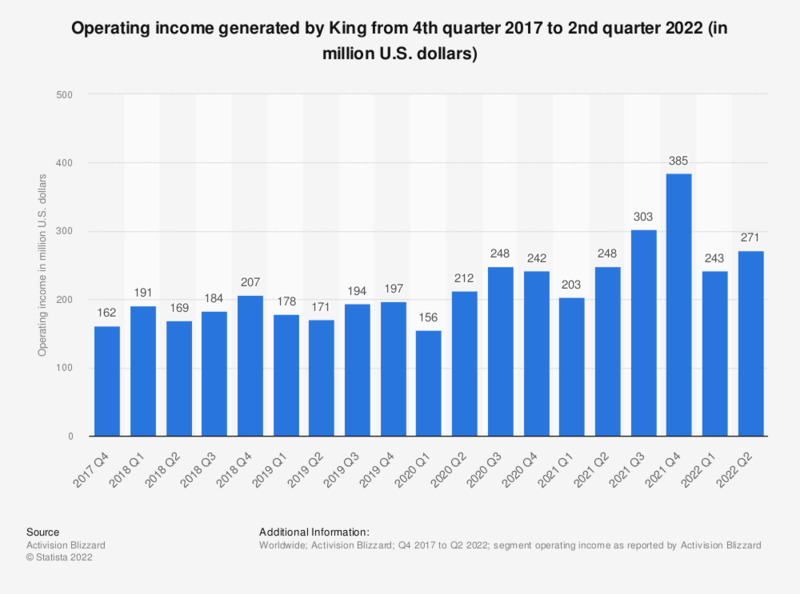 According to King Digital Entertainment, the company believes that this metric provides a meaningful measurement of their business performance during a particular period because it measures the total cash spend by their players in the period. Gross bookings is not computed in accordance with IFRS and, prior to June 2013, included amounts collected for advertising space sold.